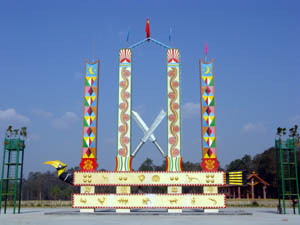 Before the Munao Zongge Gala, the “Munao Display Poles” should be erected, the two in the middle carved with sun pattern to denote the male gender and the two at both sides with moon pattern to denote the female gender. The knife and sword patterns in middle poles represent the productive and living tools and fighting weapons of Jingpo people. The crisscrossing grains on all poles stand for Jingpo people’s north-to-south migration routes. The breast pattern on the beam shows people’s worship to maternity and the peacock and hornbill patterns embody holiness and auspiciousness. Other delicate patterns express people’s longing for happy lives. The dancing route should follow the patterns on the display poles without any willful change and these complicated routes have been rooted in minds of “Dongsa” (host of sacrificial rites) and “Naoshuang”, the pace-setter. With their mysterious patterns striding over the long river of history, Jingpo people commemorate their ancestors and look forward to the future. It was made of wood and set up in March 1952. Now, the other part of the pole is corroded and its patterns cannot be recognized except this remains. The volute designs carved on the remains represent the layout of Munao Zongge Dance. The carved lines are all symmetrical and full of aesthetic feeling. The two curve lines in the middle extend throughout the whole display pole. This kind of design is called "qintui", a design formed with straightforward carved lines, representing the layout of a dance and a sequence of dancers. It is the only chart of dance survived hitherto. Munao Zongge means “let’s dance together” in Jingpo language. Long ago, the earth was covered with dead silence without even a slice of happiness. On the contrary, the Solar Palace was full of boisterous singing and dancing. Curious, birds of all species went to the palace for a clue. Finally, hornbill and peacock brought back with them the secret of the palace’s jubilation---Munao Zongge. The news spread quickly among birds and got known by Jingpo ancestors, who followed suit to hold Munao Zongge Gala of their own. Afterwards, Jingpo people have been prosperous with harvest of livestock and grains. They lived happily ever afterward. 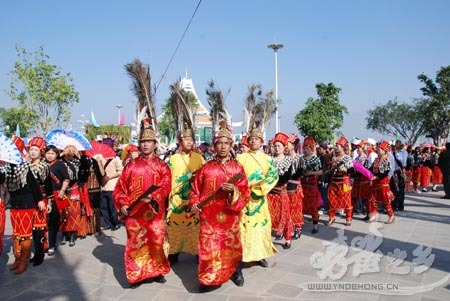 Now, the large-scale Munao Zongge Gala is held on 15th of each year’s first lunar month. On the very day, people in full attires from all directions get together at the Munao Zongge Square. To the accompaniment of drum, gong, and Lusheng pipe, they form two long queues, and led by “Naoshuang”, the pace-setter, they step in the dance arena. With joyous drum clangs and happy melodies, dancers flourish their swords, colorful handkerchiefs and fans, making full display of splendor and grandeur. More people join in and the dancing queues become longer and longer. Winding and wagging, the queues march forward separately now and mix and cross then. Dancers jostle each other but never lose their wholeness from head to tail of the queues. The queues, made up of a thousand people at the least and over ten thousand people at the most, move and roar like two dragons. This is the greatest group dance in the world and is called the world grandest dance.